Barbara Agreste was born in Pescara. Very early in her life she showed a passion for drawing, and her parents agreed to let her train at the art school in her city, a period in which she also took dancing classes and and trained as an actress at a regional Academy of Performing Arts. Later she moved to Milan to attend a course in Theatrical Design at Brera Academy of Arts, and soon after she moved to London where she continued her studies of contemporary dance, soon starting to work as a performer for Rawhead Dance Theatre Company. After her experience with theatre and live performance, Barbara returned to devote herself to the visual arts enrolling in Kent Institute of Art & Design where she learned the techniques of Film & Video Production, and deepened her knowledge of psychoanalysis, philosophy, gender studies, and film theory. Barbara graduated from KIAD in Visual Communication with First Class Honours, and returning to London achieved a Masters degree in Fine Art at Central St. Martins College of Art & Design (University of the Arts). Since then Barbara has continued producing film, music, photographs, and paintings, exhibiting and attending film festivals all around the world. Barbara lives and works in London although her visits to Italy are very frequent. 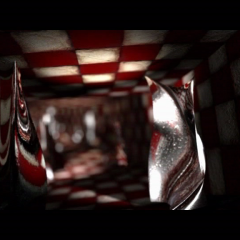 The Checkered Tunnel is a animation made entirely with 3D software. This short movie represents a fragmented space made of a chequered tunnel where the squares that fill its walls, floor, and ceiling alternate from red to white (the colour red is a metaphor for trauma). At the opening of the piece the point of view of the spectator (the camera) is turning on itself in a chequered room with a missing wall leading to a black void. The camera moves back and forward unsure if to dive into the unknown darkness, or to stay in the trapping room with no other exits.